After years of research and diplomacy – and unimaginable feats of transport and exhibition construction – the London Science Museum’s new show, Cosmonauts: Birth of the Space Age, is at last underway. Besides setting the record straight on the USSR’s pre-eminence in the development of space travel, Cosmonauts brilliantly expresses not only the technological prowess but also the deep humanity and emotional intelligence underlying these developments. While much of what is on show is impressive and awe inspiring, there is also something deeply moving about seeing Tereschkova’s charred and abraded Vostok capsule, Gagarin’s space suit, contemporary film clips and assorted relics of commemorative souvenirs – a lab coat scrawled with an impromptu celebratory slogan, specially designed china, playing cards and even a samovar. They bring the whole epic adventure back down to earth even as you find yourself gasping in front of an experimental lunar lander and marvelling at the range of technological suiting designed for maximum comfort and safety in every extreme of the space environment. Mir space station base module table, c. 1990. See full detail in the excellent catalogue – Millard, D (ed.) Cosmonauts: Birth of the Space Age. London: Scala, 2014, p 133. 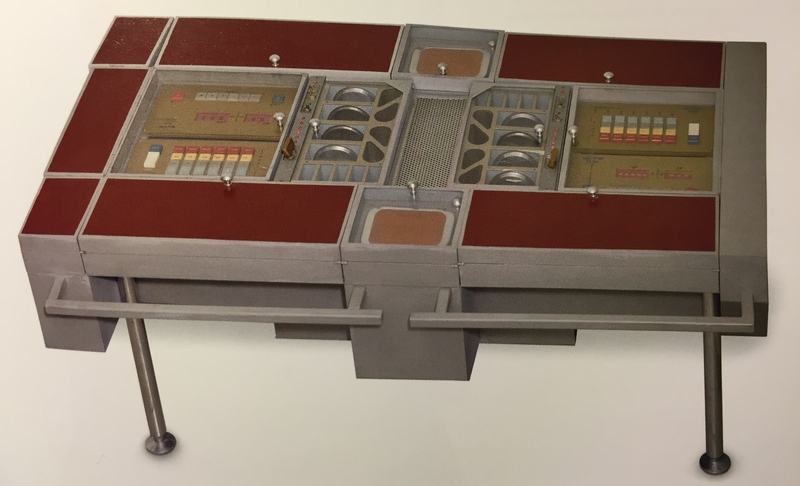 For me, though, the most thrilling aspect of the exhibition is one of the most basic and ostensibly least exciting: the table from Mir, shown in the photograph above looking as much like a model from Thunderbirds as a relic of the space age. I’ve written and thought about that table, and used it as a core argument for the contrast in space culture between the USSR and the USA, but I’ve never seen even a decent photograph of it before. I knew it was an amazing object, with its central suction device to manage crumbs and its heating compartments for the food; and that the very presence of a dining table was a radical statement of convivial intent in a total habitable space of 90 cubic metres, but I was unprepared for its beautifully designed fold-out sections and contrasting grey-blue and ancient red colouring. It’s still hard to imagine being a Cosmonaut strapped down to dine on some canned chicken stew and Borsch from a tube as the cosmos hurtles by, but seeing an object of this nature and scale certainly helps me to begin to enter that imaginative space. If you are anywhere near London before 13th March 2016, don’t miss it.